Bringing the world to Eastern NC — and sharing Eastern NC with the world. What do I get if I’m selected as an ENCIP intern? And the immeasurable value of an intentional experience in a new place that is eager to welcome you! Read about our program history in this news article published by the Duke Office of Civic Engagement. Sammy graduated from North Carolina State University with a B.S. in Agricultural Economics, as well as an Associate's Degree in risk management and a Chartered P&C Underwriter Designation from the American Institute. He worked in insurance underwriting in Raleigh, N.C. before returning to his native Edgecombe County in 1990 to operate Fountain, Roberson & Anderson Agency, Inc. Sammy likes to spend his spare time outdoors, whether working in the garden, running, golfing, or playing tennis. "I am a big advocate for my community, because I believe that our small town way of life provides an excellent area for raising a family. I want to offer this pleasurable lifestyle to anyone and everyone — and I recognize that to accomplish this goal we need improvement in our schools, in the broader opportunities for our children, and in the general wellbeing of our citizens. I believe our ENCIP interns can be sparks that light those fires of achievement." 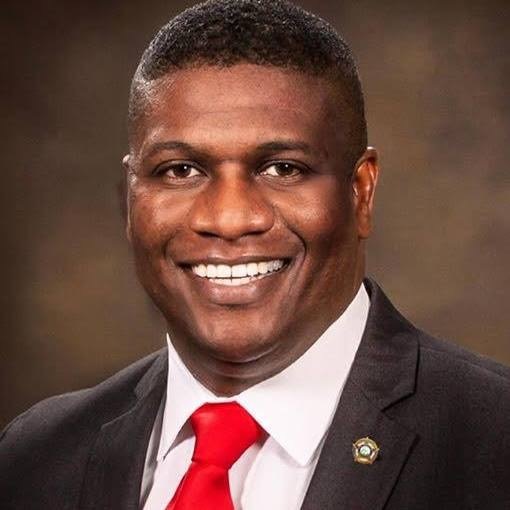 Before being elected as Sheriff of Edgecombe County in November 2018 and appointed as Sheriff on April 3, 2017, Sheriff Atkinson was a Master Trooper with the NC State Highway Patrol. Sheriff Atkinson began his law enforcement career with the Highway Patrol in February 1997, when he was assigned to work Edgecombe County. In January 2013 he was assigned to Executive Security for the Governor of NC in Raleigh. Community involvement is very important to Sheriff Atkinson. He is dedicated to his roles as a NC High School Football Official and Chairperson of THINK (Thornes Chapel Inspiring Neighborhood Kids). Joy Chafin graduated from Meredith College with a degree in chemistry and completed two years of post-graduate studies and research at East Carolina University before accepting a position at Medical University of South Carolina. There, her responsibilities included DNA sequencing of samples for the entire university, its hospitals, and all associated research facilities. Since moving to Tarboro with her family several years ago, she has embraced many service opportunities and especially enjoys being a Girl Scout troop leader and school volunteer. She loves to read and works hard to nurture a love of reading in all children with whom she works. She loves to travel and learn about new cultures, and she's especially proud of the global school and Spanish immersion program that Edgecombe County Public Schools has implemented. "Although not originally from Eastern North Carolina, I have felt right at home in Tarboro since moving here. Great things are happening in Edgecombe County, but there is still much untapped potential. I am honored to be on the Board of ENCIP as we continue to seek innovative strategies to tap that potential. It is exciting to see how our collaborative efforts are benefitting us all — the community, the interns, the board, and the volunteers." Shanell Knight Daniels is a native of Tarboro, NC, who ventured into Wake County after completing her high school education. While residing in the Wake County she acquired the educational credentials, and later her degree allowing her to work in the early childhood profession for 11 years. In 2007 she decided to return to her hometown and assume the role of assistant director with Think and Grow Childcare Center, a family-owned business. Daniels continues to work with Think and Grow as she and her husband raise their high school age son and nurture their 4 grandchildren. Daniels, a product of a family of entrepreneurs, decided in 2016 to combine her passion for helping children while improving her community and founded Michael’s Angels Girls Club, Inc. Each day Daniels works to live and share her club’s motto of Converting Idleness to Action. After graduating from UNC-CH with an AB in Social Studies Education, Mary Jane taught in the Atlanta Public School system and in Raleigh. Eventually she moved to Tarboro — her husband's hometown — where she continues to volunteer as a tutor in Edgecombe County Schools. Mary Jane loves playing duplicate bridge, spending time with family, and enthusiastically attending as many UNC sports events as possible. "I love this county and all of the people who live here. I want our county's doors to be open to all people: I want to see equal opportunities in education, health care, and economic development so that all our citizens can have a good life. My children were supported by everyone as they grew up in this county — teaching me that if we work together, we can provide for all of the children and families who live here now. I'm excited to be a part of bringing this experience to fruition through ENCIP!" Lauren serves as the principal of W.A. Pattillo Middle School in Tarboro, NC. She graduated from West Chester University with a Bachelor of Science in Psychology and joined the Eastern North Carolina Corps of Teach for America. After earning her teaching credentials at East Carolina University, she earned a Master of School Administration degree at NC State University as a Northeast Leadership Academy Fellow. Lauren shares her passion for education reform with her husband, and the couple resides in Tarboro, where they are both administrators currently pursuing their Doctorate of Education at NC State University. "Moving to Tarboro has allowed me to see the power of intentional community building. Through ENCIP, I hope to share the growth we have fostered inside our community with individuals that are not from the area. The spirit of relentlessness is contagious; I know the ENCIP scholars will be impacted by the summer they spend contributing to meaningful work in our area. I'm honored to be a part of the planning process." A Tarboro native, Caroline works as a content specialist for the Morehead-Cain Foundation at UNC. In her previous work as a freelance writer, her projects included Our State book reviews, NPR news stories, and commissioned podcast episodes on topics as diverse as the economics of farmland and the health systems surrounding depression. By way of the Robertson Scholars Leadership Program, Caroline graduated from UNC-CH in 2015 with a degree in public relations. Her favorite things to do are travel (especially international), backpacking (backcountry), running (half marathons), reading (a lot), and vermicomposting (i.e. pet worms). "I absolutely would not be where I am today if it weren't for the support of the community of Tarboro throughout my life, and I am so happy to be part of a team working to share that special connection with others. Eastern NC is a trove of compelling individuals and resilient, welcoming communities— I'm delighted to be showing it off to the rest of the world!" After finishing high school in Charlotte, Bill attended undergrad and medical school at UNC-Chapel Hill. Bill moved to Tarboro in 1995 and worked for over a decade in private practice before joining the School of Medicine at East Carolina University/Vidant Health where he is the program director for the Internal Medicine Residency. He is a member of the Episcopal Church and serves on the Edgecombe County Health and Human Services Board. Bill and his wife have 7 children and live in the downtown historic district of Tarboro. "We started The ENCIP because we know that belonging, along with purpose, gives meaning to life. I want The ENCIP to help share this gift of meaning by creating larger connections inside and broader connections outside our community. Come and experience belonging. Come and learn purpose in serving. You can be a life-giving meaning." Meredith is originally from Red Oak, N.C. but fell in love with the town of Tarboro as she was falling in love with her husband, Michael, a Tarboro native. After receiving her undergraduate degree from North Carolina State University, she earned a graduate degree in psychology from UNC-Wilmington. Meredith enjoys working with children, adolescents, and families in Tarboro and the surrounding areas as a psychologist at Tarboro Pediatric Psychology. She specializes in the assessment and treatment of many childhood disorders, including PTSD, anxiety, AD/HD, autism, OCD, eating disorders, depression, sleep disorders, and issues related to divorce or custody. In her free time, Meredith enjoys paddle board yoga on the Tar River and attending yoga class at Tarboro Brewing Company. Meredith is also a certified Child Light Yoga Instructor and enjoys sharing her passion for yoga with children in the community. “After my husband finished law school, we decided to move to Tarboro with our 6-month-old daughter, Lily. The people of Tarboro welcomed us with open arms, and we are proud to call Tarboro home. I believe that ENCIP offers our community and interns a brighter future!"